"The Magician" of Jamaica wins Open! Bertram Scott, "Matthews wins… Brown Scores NM Norm," Jamaica Ambassadors Chess Academy, 18 October 2005 (Kingston, Jamaica). NM Shane Matthews (right) accepts his first place trophy from JCF President Ian Wilkinson (left) and National Master Geoffrey Byfield (center). Photo courtesy of Jamaican Chess Federation. National Master Shane "The Magician" Matthews won the 2005 Jamaica Open on a tie-break from FIDE Master and reigning Jamaica Champion Warren Elliott. Both players ended with a score of 5/6. Matthews also defeated FM Elliott on the way to his undefeated performance. NM Duane Rowe and Candidate Master Equitable Brown tied finished 3rd and 4th, respectively, with 4½/6. Brown finished the Open with a 2200+ rating thus gaining his first norm for the National Masters title. The Amateur Section was won in fine style by Walter Williams with a perfect 6/6 score. In 2nd place was Onaje Lamont with 4/6, and 3rd Hakim Buchanan also with 4/6. Melissa Smith won the Women's section also with a perfect 6/6 from her sister, Annesha Smith with Shanice Myrie in 3rd. Ian Barnett won Best Rural player prize after scoring an upset win over NM John Powell. The Best Junior prize went to Mikhail Solomon who scored a shock first round win over NM Mark Holness. At the Awards Presentation, NM Russel Porter, who dominated in 2004, was voted Player of the Year 2004. Porter turned in an outstanding performance for Jamaica at the 2004 Olympiad in Mallorca, Spain, and also won the Masters KO, the Bob Wheeler Open, and was 2nd in the 2004 Jamaica Championship to FM Elliott. A special Certificate of Merit was presented to JCF President, Ian Wilkinson, for his outstanding publication, "Magnificence in Bled". 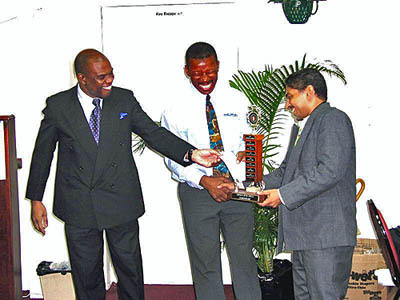 Peter Myers received the 2004 Journalist of the Year Award for his reports in the media, while the Liguanea Chess Club was presented with a special plaque for its contribution to the development of chess in Jamaica. Note from Peter Myers: The Jamaican Open was sponsored by CB Traders and Hotel Four Seasons. The next Open Chess Tournament on the Jamaica Chess Federation calendar, is Clarendon Open scheduled to take place on November 19 and 20 in May Pen, Clarendon. Details to be announced soon.